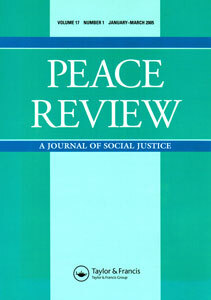 Peace Review is a quarterly, multidisciplinary, transnational journal of research and analysis, focusing on the current issues and controversies that underlie the promotion of a more peaceful world. The journal defines peace research very broadly to include peace, human rights, development, ecology, culture and related issues. Social progress requires, among other things, sustained intellectual work, which should be pragmatic as well as analytical. The journal firmly upholds its stance that results of this intellectual work should be ingrained into everyday culture and political discourse. To view more of Dr. Richard Matthew’s latest edition to the journal or learn more about Peace Review in general, please click here.